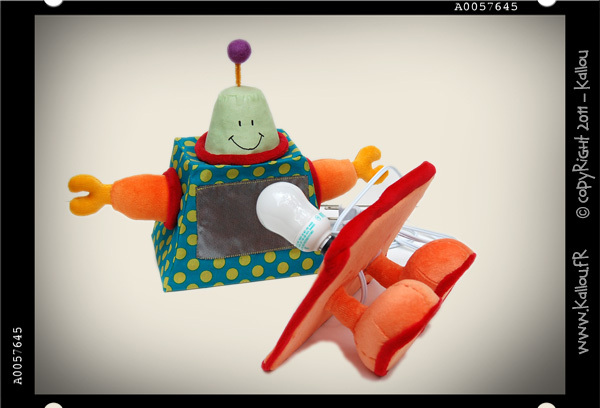 Luno the robot who know how to sew! But not only! Like the previous version, Luno 2011 can sew, send messages to your mobile phone. It is remotely programmable through it wireless connexion, he is still compatible with 110 and 220 volts, he always know how to plug himself and can go with you, wherever you go thanks to its compact size. Yes, but not only! The new version has been improved and now Luno knows how to make light! Brilliant idea, right?! Luno, in his extreme kindness, has even agreed to show you her privacy! Isn’t it sooo nice? Luno will also come with us on the Maker Faire show! He’ll be a good helper to manage the cash! The numbers, he must know everything, don’t you think?! If you go there, do not hesitate to give us a hello (I know North Carolina is not next door)! We will be so pleased to see you there! I also tried the jawbreakers exercise : trying to take a picture of lighting Luno … “Trying” is the right word, I think! Finally, it gives a vague idea of ​​the result! Now, Luno sits in Florent’s room, as he is his 2 years old birthday gift ! People whisper to the headset that Florent was born on January 6?! Not possible …. Il est génial!!!!! Même si, perso, je l’aimais bien avec ses oreilles… comme ça, je le trouve un peu “nu”.